Self guided deer hunts begin with scouting building towards a hunt itself. No surprise here. Just our agreeing where our article begins. But, not all have time to scout. It is always interesting to us the number of folks who come out each season, tag a trophy, all without any prior scouting. Proved every season scouting or not isn’t a success enhancer/degrader. The average days of reservations for all Association folks is 12.7. Those who put the most time are fishing only memberships. Fishermen often have a reservation each week for somewhere from May through October. Deer hunters are the other side. Deer hunters hunt on average 7 days, making 9 days of reservations on a week long trip of Saturday through their vacation week until the ending Sunday. Many deer hunters never return until the next deer season. 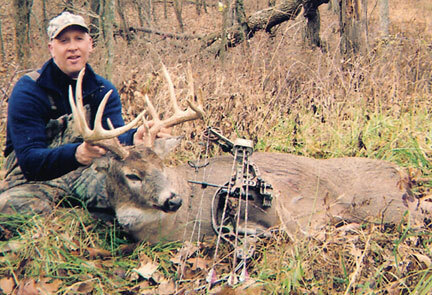 This article is for the first time central mid-west deer hunter. Those not familiar with our terrain. 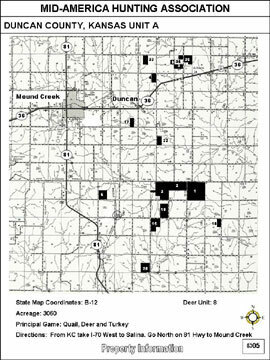 Mid-America Hunting Association self guided deer hunts provide a range of private land with various seasons. Or, flexibility in both time and location. Amongst all possibilities there does stand an approach which has gained satisfaction of first year MAHA hunters. Hunt your buck of choice to your own trophy standards. Never do we promote only trophy bucks. Self guided deer hunts means each makes their own days afield. Their own equipment, transportation, skill. We provide many grain productive farms. When selecting from aerials of first to last farms many hunters look at habitat alone. Cover visible in aerials. Then amount of habitat. Mostly concentrating on trees. An overwhelming belief is more trees equals better opportunity. We agree to a degree. What most find different is protective cover is inclusive with other than trees. Brush, grass, is not visible on aerials. Both are great cover capable of concealing much. We would further add to someone’s analysis additional decision criteria of type/size of habitat is not enough. Selection criteria of location is of benefit or consequence. Best spots of cover/food/water outside direct line of observation from roads, farm yards or other human presence. These are the scouting/hunting points to draw from aerials. A quarter section above. A 1/2 x 1/2 mile square. One hundred sixty acres. 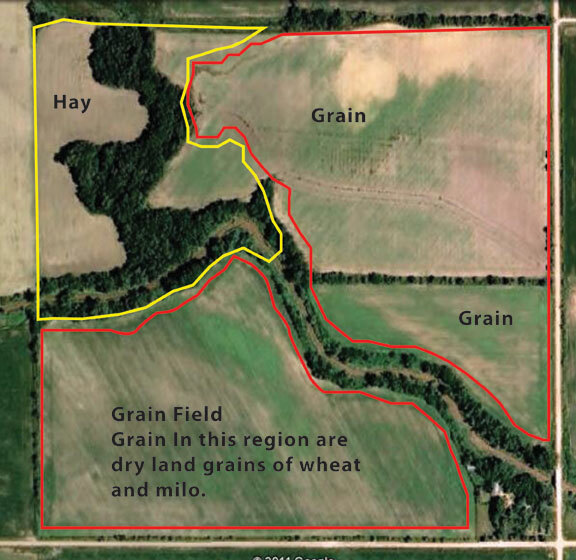 Its mix of grain fields with protective cover is average. Not our best or worst in terms of cover/food/water. The yellow is out of direct observation. Red areas can be easily seen from roads on the east and south of this spot. This distinction of out-of-direct-line-of-sight ground is a method where we can narrow down where potential payoff is greater. Scouting or hunting would be to the ground in side the yellow line. Then move onto another piece of ground and repeat this same distinguishing effort. We do not intend to teach scouting. This article is an illustration about how many who first look at us do so seeking a single spot. 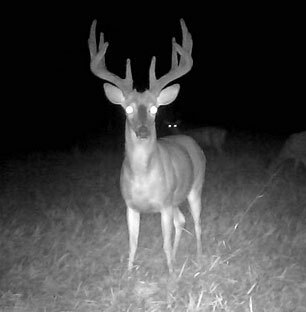 Benefit we bring is each can have several spots to hunt each day thereby increasing his chance of getting on a big buck. To get to any lease would be by means of an online map library road map available through the members’ only web site. Our online library has all spots on map sheets (sample at right). Each farm is numbered. Hunters would make a reservation to a spot of his choice for days he wants. Having several spots of where to spend each day allows for hunters to find a buck of choice. Choice includes a hunter can hunt his same spot(s) season to season. He also should add a new spot or two each trip. A much better approach than selecting just a single farm hoping a buck shows. Or, a means of building on prior success rather than relying on past performance. Next, simply get boots to field to confirm/deny what aerials indicate to be true. Everyone may scout as much acreage as they have time to cover. There are limits. Those who are excessive with cameras will be told to slow down. Also, during anyone day be it for hunting or scouting a maximum of two spots may be accessed. This means of limiting pressure is exactly why folks hunts with us for years. Association land is not public playground. Every action we take is for hunt execution quality. Starting point ideas are available from who draw financial motivation from insuring everyone has a good experience. Us. Only we have been on or seen every Association lease. Over many years. From scouting to when actually in stand things do change. If a favored spot(s) is picked it may be hunted every day a hunter has. A further benefit is no single hunter is limited to just one spot. If after a half day or more a favored piece just does not produce, hunters can move onto another. We recognize success is effort intensive. A penalty of self guided deer hunts. It also must be accepted by hunters. If not we may not be the right choice. Traveling hunters pressed to make a good go of it can start small building up later. First year effort should concentrate on one state. Execute a thorough scout or hunt. Once satisfactory land knowledge is accomplished of having several high confidence spots well learned the next state’s effort may begin. To attempt a good level of effort in two states at once or each year would likely stretch anyone too thin. Once a hunter has himself well established in a single state then expansion to another, subsequently to a third will maximize his flexibility. A flexibility to make easier limited vacation day planning. Usually by someone’s third year he has enough time to have refined his initial selections gaining more confidence in his spots. We typically all agree having confidence in a spot is the best motivation for those hard days in stand.